We use this book in all our level A classes: A1, A2, A2+. It is the first part of a foundation course in Swedish as a foreign language. The material has a fast progression and a wide variation of texts and exercises. It also gives you access to additional content on the internet such as audio tracks and extra exercises to study on your own. 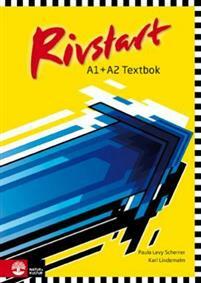 Furthermore there is a app Rivstart A1 / A2 available in the various app stores, by Natur & Kultur (paid).